Figures 1 shows the forecast track as of Wednesday afternoon and the cone of uncertainty along with inventory of cattle and calves based on the 2012 USDA NASS census data. As people evacuate large areas of the Southeast coast, beef producers and other livestock producers are bracing for the worst. Hurricane Florence will make landfall along the Southeast U.S. coast as a major hurricane late Friday or early Saturday and the damage is expected to be substantial. Florence has the potential for major impacts on livestock producers due to damaging winds, record rainfall and widespread inundation and flooding. Figures 1 shows the forecast track as of Wednesday afternoon and the cone of uncertainty along with inventory of cattle and calves based on the 2012 USDA NASS census data. 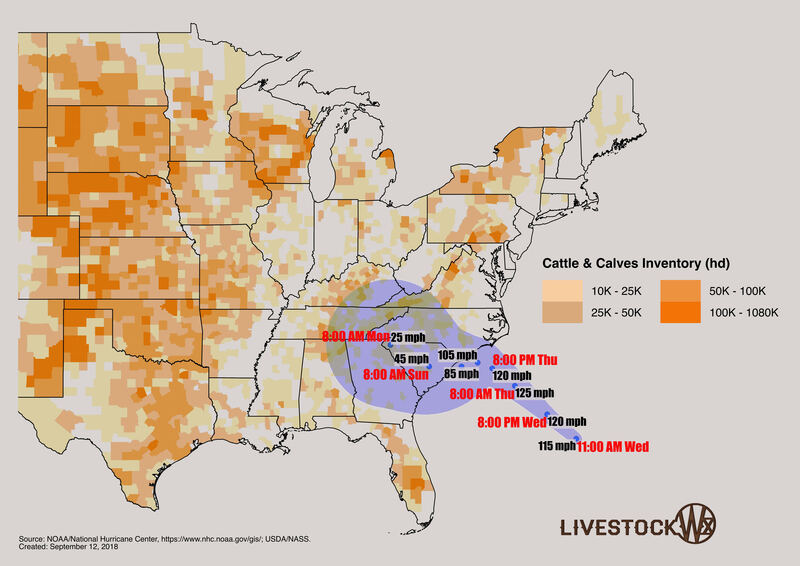 As of this writing, approximately 5.4 million head of cattle and calves are in the path of Hurricane Florence. Include their location and any records of vaccinations, testing and ownership. • Have identification for all animals. Ensure animals are properly vaccinated before exposure to floodwaters. • Be aware animal behavior may change before, during and even after a disaster. If you must evacuate, ensure your family’s safety first. If there is time - move or evacuate livestock and horses to higher ground. If there is no other alternative, keep gates or buildings open so they can escape high water. Establish escape routes to safe locations (higher elevation). Place your contact number and the name and number of your veterinarian on a building. • Assess your animals and building structures. Survey damage to your barns and other structures; assess the stability and safety. Examine your animals closely; contact your veterinarian if you observe injuries or signs of illness. • Return animals only after the threat has passed and the safety of buildings or the area has been assessed. Release animals in a safe and enclosed area until familiarity of the surroundings can occur. • Provide non-contaminated feed or water. Do not feed flood damaged or moldy feed or hay. Check with your state or local authorities for proper disposal methods for animal carcasses. Keep animals away from flood waters which may contain harmful bacteria or chemicals. Monitor animals daily for signs of illness. Be sure to keep updated on the latest weather situation through information issued by official government sources. You can also obtain a snapshot of information at www.rainforecaster.com. McNutt and Feldt are principles in Livestock Weather, a leading source of weather content specific to the livestock industry. Contact them at www.livestockwx.com.